"The goal is to start the season well. I don't want to give myself any other goal. I just want to arrive in Australia well prepared." I think you can safely tick that off the to do list, Rafa. He'd never won Doha before, although he came very close in 2010. He'd had much more luck in doubles, winning in 2005, 2009 and 2011. This year, he entered the doubles with the person the media refer to as his travelling coach, Francisco Roig. They had a very satisfying win over Pablo Andujar and Lukas Rosol in the first round, beating them 6-3, 2-6, 10-4. They then bowed out in the second round to the number 3 seeds, Ivan Dodig and Marcelo Melo, 6-4, 7-6(1). But it was the singles that mattered. His first opponent had many of us cowering behind our sofas. It's not that Lukas Rosol is exactly a giant among tennis players. In 9 years of professional tennis he has won one title (Bucharest last year) and never even reached another final. In 22 attempts at Grand Slams he's won fewer matches than Rafa has Roland Garros titles. 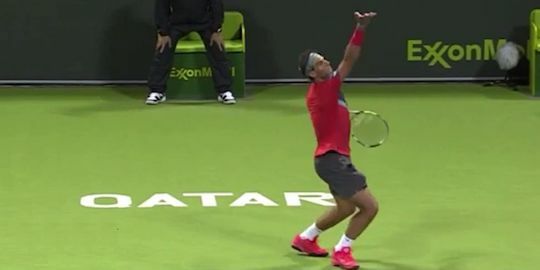 He has only ever qualified for 13 masters events (that's half the number of Masters titles Rafa has) and has won a total of 5 matches (the same number as Rafa has Grand Slams not on clay). But few of us will be able to forget that appalling first meeting at Wimbledon (assuming the commentators would ever let us, that is). Rosol clearly thought that he had a good chance to repeat that feat, forgetting that Rafa is now healthy, so it was a really satisfying win for Rafa, 6-2, 7-6(7). Watch highlights here, here and here. We weren't so worried about Rafa's next opponent, Tobias Kamke even though they had never played before. Big mistake. Rafa served well but found it very hard to break Kamke's serve with Kamke saving 9 out of the 12 break points he'd conceded. After a gruelling (for us at least) 2 and a half hours, though, Rafa emerged the winner, 6-3, 6-7(3), 6-3. It was back behind the sofa for the quarter final. We know he's beaten Ernests Gulbis every time they've played (and that's on three different surfaces) but I guess we begin to believe Gulbis's self hype and wonder if this will be the time he justifies his belief. It wasn't. 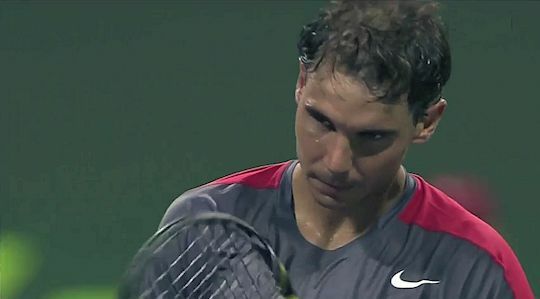 It took less than 2 hours for Rafa to get a pretty straightforward victory in straight sets, 7-5, 6-4. So the matches we were concerned about were relatively OK and the one we weren't worried about was a bit of a nail-biter. On paper the player with the tongue-twister surname, Peter Gojowczyk, shouldn't be a problem in the semi final, should he? Of course he was. With Rafa a set down, the back of the sofa beckoned once again. 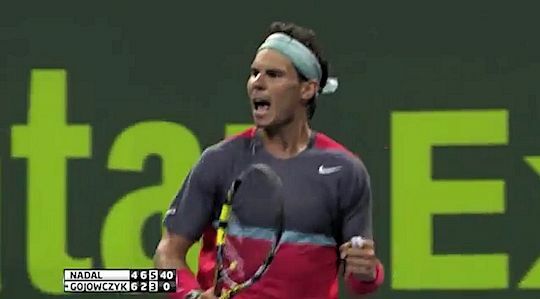 It fired Rafa up, however, and he didn't concede a single break point in the second set. 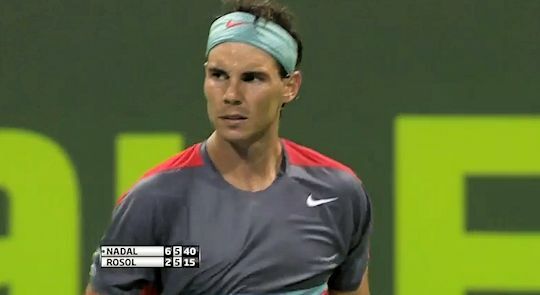 The third was tighter and Rafa did get broken once but luckily he broke Gojowczyk twice to win the match, 4-6, 6-2, 6-3. 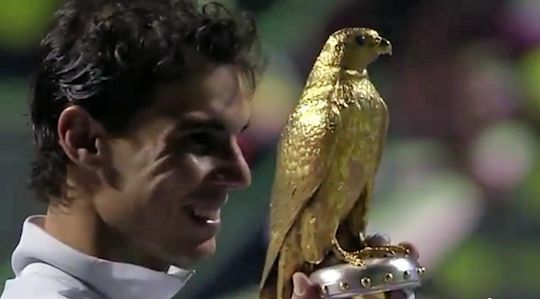 So he was in the final to face Gael Monfils whose only two wins against Rafa were at this tournament in 2009 and 2012. Monfils had played a superb tournament to reach the final without dropping a set but when Rafa won the first 5 games it looked like this would be all over in no time. However, Monfils wasn't going away that easily and took the second set on a tiebreak. 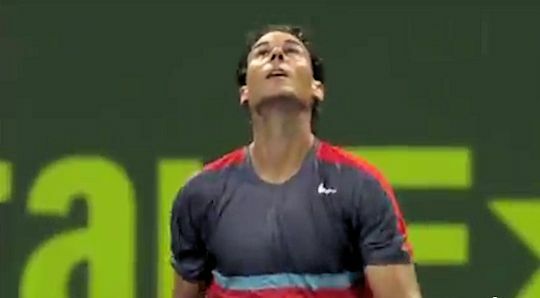 The decider was all Rafa, though, and he took his 61st ATP title, 6-1, 6-7(5), 6-2. This is the first season that Rafa has started out with a tournament win. We hope it is a good omen for the rest of the year.